Every year, 20 November is celebrated as “Universal Children’s Day”, commemorating the anniversary of the adoption in 1989 of the United Nations Convention on the Rights of the Child. To mark this day, SOS Children’s Villages, the world’s largest non-governmental organisation focused on supporting children without parental care and families at risk, is calling on the global community to increase investment in supporting family care for children in vulnerable circumstances. An estimated 220 million children, 1 in 10 of the world’s two billion children, grow up without the loving care of a parent or stand at risk of losing it. “All of us share a common concern for the critical situation of the child who has no one. I have seen first-hand the positive impact that quality, family-like care has on a child’s life,” says SOS Children’s Villages CEO Norbert Meder. In its newly-released ‘Care Effect’ paper, the organisation presents a summary of global research which shows that without the loving care of a parent or other adult caregiver, children are less likely to develop the skills they need to become contributing members of society. They struggle to achieve their potential, do less well at school and have trouble focusing and developing social skills. Later in life, they are also more prone to depression and substance abuse, leading to higher rates of attempted suicide. The report concludes that “if we provide care for today’s children in vulnerable circumstances, giving them the foundation they need for learning and developing life skills, we stand a better chance of building a better future for the world”. 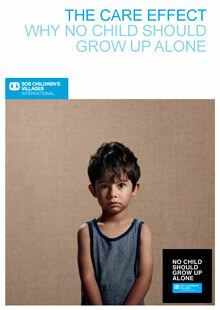 SOS Children’s Villages’ message that ‘No child should grow up alone’ is also emphasised in a global video campaign which is based on a selection of home videos that were filmed by children or their families around the world. These short videos show everyday moments of affection and fun between child and parent. But a final image shows a child who has nothing to film. The viewer is left with the poignant message that “1 out of 10 children has nothing to show”. A sneak preview of this video in 14 languages was released on nochildalone.com on 7 November when Vincent Kompany, international football player and SOS Children’s Villages International Ambassador, committed his support to the campaign via social media, asking his followers to help promote “one powerful message”. SOS Children’s Villages was founded in 1949 with the mission to ensure “a loving home for every child’’. Today, the organisation runs over 1,800 programmes reaching more than one million children and adults in 135 countries and territories.